Family Tree is an ideal and fun activity for students to practice family relations and working within that semantic field. 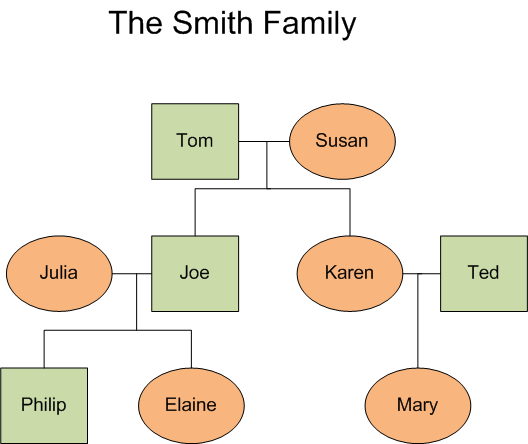 The basic idea is that you give your students a series of statements about a family such as, “Joe is Mary’s brother” and, “Frank is Julie’s Grandfather” and so on and from these, the students need to construct a family tree. It takes not only knowledge of English but also a bit of lateral thinking on the part of the students and is an ideal group game. First off draw a family tree with all the relationships you want to practice. This will only be given out to the students at the end of the exercise to check against their own. Once you have this, prepare a number of statements about the relationships which will help your students construct the family tree from scratch. and so on. These can either be dictated to the class later or handed out on cards, etc. Firstly you might need to go through with the class some of the relationship vocabulary to make sure everyone’s aware of the different relationships. Next, divide the class into small groups of two or three. Explain to them they’re going to construct a family tree from the relationship clues you’ll be giving them. Start writing up the clues on the board, one at a time. As you write the students can begin work and start drawing the tree. It’s not necessary to write all the clues up so once you have written say five or six you can move around the class to see how things are progressing. An alternative to this is pin the clues in one corner of the room; each group sends one student up to find a clue, read it and then come back and tell it to the group. This adds a bit of extra language practice to this activity. At some point one group will work out the tree – in which case you can stop the activity to check against the master diagram – or they’ll get completely stuck in which case you can write up a few more clues. The winner is the first team to put together a family tree identical to the original.